GAYANAT - eng: KAMAL SABRI: CHARISMATIC SOUNDS OF SARANGI. Indian culture is amazing and mysterious like people that were creating the country during many years. This country used to be close-off for Europeans during long period of time, it used to be magic, like it was created by different sky born civilization. Today time has changed, now we can explore India, discover it under global village era. It seems like this country is very familiar. We can hear its music, its ancient voice sounded by tabla, sitar and veena. Sarangi is also the voice in the choir of Indian music culture, which is less well-known than its legendary brothers. This instrument reminds lute and is used both in classical and folk Indian music. There is a legend that sarangi is so difficult to master that only family of the creator was able to play it properly. Kamal Sabri from India has different opinion. Kamal devoted his life to sarangi and teaching this challenging art. He has been our guest in Russia and has told us about his dream: the musician wants the sound of his country, the sound of his favorite instrument to be known and loved by the whole world. Kamal Sabri: about music, God, dreams, talented prisoners and about ways of soul-curing. GN: Please, tell us about yourself. We would like to hear from you your story of music. 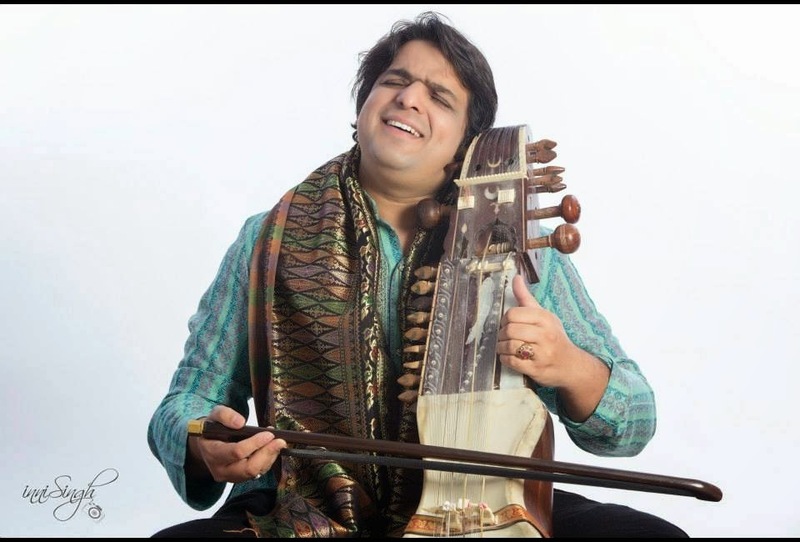 KAMAL: My name is Kamal Sabri and I play sarangi. My father, sarangi legend, Ustad Sabri Khan, taught me the art of this instrument. I began first lesson of my life on sarangi, when I was 5; at the age of 13 I went to Europe tour with my father. My first concert was in Queen Elizabeth Hall in London. It was a great concert, I was highly acclaimed by the audience. Till that moment I had not been serious about this art, I always wanted to be a cricketer, as cricket is the most popular game in India. But destiny brought me to England where I used to live for a long time. I travelled over the world, often performed and became famous sarangi musician. I represented India abroad at many festivals. I collaborated with world famous musicians and even with rock-musicians; it was interesting to play especially with the Polish musician. And today I am performing in Moscow, it is so wonderful here. This is my first visit to Russia. I heard from father about Moscow audience, he has been here many times. From the childhood I was dreaming to visit the church on the Red Square (perhaps, it is meant to be the Cathedral of Vasily the Blessed) and, finally, my dream became true, as before I had seen this church only in pictures. GN: Nevertheless, were you forced to become a musician or that was a free choice? KAMAL: Somehow it was my choice. At first, it was a force, but then it turned into my choice. I was the child in our family that had to carry on family music traditions. My father chose me and I think it is a real fortune. I never realized how important that was, to play sarangi, as I was addicted with cricket. Sarangi is one of the most difficult instruments of Indian classical music. You need a lot of efforts to master this art, it even might be boring sometimes. When I was a kid, I never used to sit. My father and brother made me to practice music at nights so that the quality of my music would evolve more and more. When you are a son of a legend, people’s expectations are too high. You cannot be a musician at a medium level, you have to be the best. KAMAL: Yes, I have always been perfectionist, because I have this burden on my shoulder. I like perfection in everything. This is how I became a sarangi player and I am sharing my art wherever I go. GN: You mentioned that the public reaction affected you a lot. Does it mean that after the concert you got to understanding more that it is your life path? The audience was impressed by your performance. KAMAL: Yes, when the audience accepted me, then it gave me more motivation to practice more. Applause, praise and acceptance by the audience – at that moment I started realizing how young I was to play sarangi. Performing at the age of 10 is not an easy thing. I was lucky to have the father who could teach me all nuances of sarangi art. At the age of 9 I performed on Indian TV and was very happy about that. GN: As we see, your father is your authority, he is kind of iconic figure for you. Did you try to be like him? Have you managed to achieve his level in art or, maybe, even achieve more? KAMAL: When I was a kid, I dreamt about being like him. He was very critical, never praised me, always told me to move forward. I still think that I have to learn a lot in life, that my life is too short to achieve my father’s level. The only thing that I can is to do all in my own pace, in my own angle, in my own style. I can’t compete and be compared with my father. Moreover, he has a different style, he started in a different time. I am living in different time. He is always supporting me and teaching. I am glad that my performances are loved by people and critics. GN: The audience is very important for you, it is a motivation. How does the audience differ in different countries? KAMAL: I have noticed that Indian classical music is loved everywhere. I was in England, Germany and other countries – everywhere my performance and my instrument was loved by people. Here, in Moscow, I am very happy also. It seemed to me like people really understand Indian classical music. GN: Apart from music, what hobbies do you have? KAMAL: I practice sport, I like reading about successful musicians and persons, about their success stories and life. I love historical places in different countries, I love teaching music for children, who don’t have opportunity to receive a proper education. I go to wiped out regions of India and play music there. I also taught imprisoned people in the Tihar Jail and, you know, there are quite successful musicians. This is one of the biggest jails in Asia. Indian government gave the task to teach classical music there and I use and bring into the world the talent of imprisoned people. We even issued a disk named «Sarangi redefined». GN: You mentioned about your interest in history of successful people. What is success for you? How do you understand it? KAMAL: For me success is capability to heal people with music. When people come after my concerts, hug me, kiss me, touch me, feel emotions from my music – this is my success that means I can heal the audience with music, I can heal their wounds. When their problems disappear and they tell me: “This is the music we want to listen to». GN: That is impressive… So, you have the critical father, you are perfectionist and, simultaneously, you are always satisfied with the audience. Does it mean that you have some kind of balance in your personality? KAMAL: I achieve the balance through spirituality. Without spirituality it is difficult to find any balance. I have been doing muslim rituals from my childhood, as I was born in a muslim family. I believe in God and I always say: whatever you do, don’t forget the power of God behind you, be connected with him. Your problems will be solved, they will get into the right track. This is how I find balance. GN: For example, Moscow residents have problems with finding their path. What can you advise them? KAMAL: I am not God that I should tell them what to do. I can tell only how I do and how I have found my path. Whatever we do, we should leave it on God and we should be with him. Stay alone, do meditation, share your thoughts with God. He is your maestro, you are his servant. He loves you more than seventy mothers: if one mother loves you like one mother, he loves you more than seventy mothers. If you make 2 steps, He will come to you 10 steps. We should always be connected with God and do meditations. I am sure that you will find God. This is how I do. GN: You were grown up in a traditional family. How does it affect your perception? Do you separate people, life, how do you perceive the world? Is it black and white or it’s integral? KAMAL: Somewhere it is black and white, it is some mixture of everything. When I feel it is not understandable, I leave it on God. Let him decide. I love to do everything properly. When I am sad, I talk to God – only God can solve problems. GN: Do you prefer to avoid giving opinion, not putting any labels? KAMAL: We are no one to judge. First of all we should work on ourselves, we should correct ourselves, only then we can give recommendations to people. I am not saying that you need to do something particular, but I know only one thing: when you communicate with God, 100% you problem will be solved. KAMAL: Oh, yes. I was a terrible fidget. I loved cricket. GN: But sarangi is such a difficult instrument, it requires a lot of patience. KAMAL: Yes, here you need a lot of concentration. I was forced to sit and I was said that I couldn’t get out during 3 hours. I was even punished and beaten. GN: Will you force your children? KAMAL: Never. Life has changed now. I can’t. I will let them do what they choose. They should be successful and good human being. And let me tell: music makes you a great person. People don’t appreciate music, but it makes you better and you get to know yourself better. It is a spiritual music. GN: You teach music to different people. How do you think, if a person should be born a musician or this art can be mastered and achieved? KAMAL: I think some people are born with it and others achieve it, no problems. There are great maestros, who are not from musical families. Everything is possible, with the help of hard work. In Urdu we say there has to be a trinity. First: your teacher should be integral and complete in all senses. Second: a student should follow the way of the teacher. Third: God’s grace should be there. So, if these three things are there, nobody can stop you. And you also should have right guide in your life. GN: Do you have non-Indian students? KAMAL: There are many students. There are from Finland, Denmark, Norway. By the way, today I have forgotten my sarangi and I played Sasha’s sarangi. That was fantastic. We found a very spiritual bone between us today (Sasha is a sarangi student). My instrument got broken and he brought his. I felt connection with his sarangi at once. I tuned it, according to my way, and played it today. KAMAL: That was an interesting experience for me, people even didn’t doubt that it wasn’t mine. GN: Is that true that Indian guru shares people into Indians and non-Indians, and only Indians can achieve this art? KAMAL: No, this kind of separation doesn’t exist anymore. We work with everyone. Once you become our student, you become our child that we should take care of. Father should take care of his child – the same thing is here. No difference at all. KAMAL: Now it’s not like this, life has changed. Tabla is the most popular Indian instrument in the world, like sitar. My purpose is to make sarangi popular as well. GN: Why do you think that sarangi is not highlighted enough, like those two instruments? KAMAL: Because sarangi musicians weren’t “extraverted”, they didn’t, they didn’t try to bring it outside India. They were restraint, they used to sit in a corner, they played, musicians didn’t communicate with anybody, they got less money. But job of sarangi player is much more difficult that job of vocalist. Musician expresses your style of singing through sarangi, he copies you, he is not playing in his own style. This is very challenging. He gets less money. To gain experience and understanding I also used to work in this way. After that I realized that I should make my instrument world famous. In 2006 I released the album named «Dance of the desert». This albom was presented for Grammy in the US Music Academy. Through that effort sarangi became world famous instrument. GN: Are you happy with your life? KAMAL: Yes, I am very happy. I want to create more, to cure with music more, to work more till the last breath. I think, I was sent by God to cure, to combine via music and to bright peace.